I came across this park whilst visiting the Chinese Gardens here in Canberra. All you have to do is continue walking from the Chinese Gardens and you in the gardens. 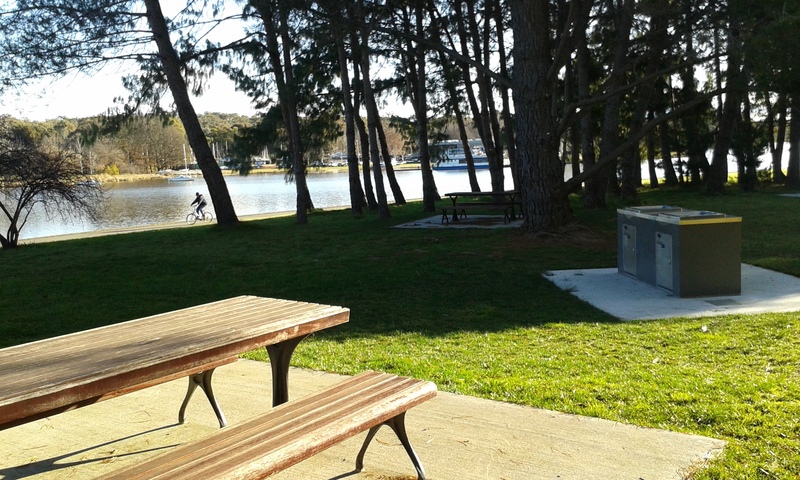 You can’t really miss them and whilst they are very small they are lovely to walk through especially on a sunny day with views across Lake Burley Griffin. The gardens were a gift from the people of the ancient city of Nara in Japan to the people of Canberra and celebrate the sister city link between Canberra and Nara. Design and construction was carried out by local designers and contractors who consulted closely with the city of Nara and the Embassy of Japan. Whilst enjoying a number of iconic cherry blossom trees. The planting scheme is mostly trees, groundcover plantings and specimen shrubs. The trees include twenty-four cherr­­y blossoms, four Crepe Myrtles, ten Japanese Maples, and one Japanese Red Pine. Shrubs include Japanese Lily of the Valley, one of Japan’s earliest spring bloomers which is still the most common shrub grown in the city of Nara’s parks because the deer will not eat it. Central to the park is the eight-metre tall pagoda, crafted by a Japanese sculptor. It stands as a miniature replica of Empress Komyoh’s towering pagoda, which was erected in Nara in 725AD. Other structures within the park are two large tōrōs, or Japanese lanterns, which weigh five and three tonnes respectively. And the World Peace Bell… The 350-kilo brass bell came from Japan and is a replica of the peace bell at the United Nations headquarters in New York. Its design includes 103 coins from nations of the UN. The bell will usually be rung annually on World Peace Day in September. That date also coincides with the opening day of the United Nations General Assembly, and national and international days of remembrance and celebration. And the final structure is a ‘Toku‘ which was commissioned to celebrate the 1300th anniversary of Nara. 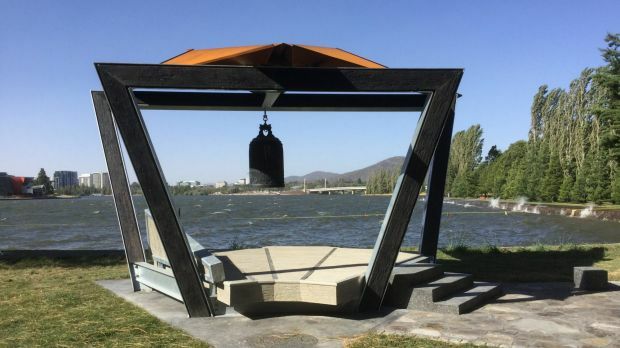 The sculpture has three main elements: A five-storied pagoda form which represents Canberra; a floating stone representing Nara; and the form of a small bird symbolising peace. The bird resembles a Latham’s Snipe, a species which migrates annually between Japan and Canberra (long way to go!!). A really lovely place to visit and enjoy the peacefulness and beauty. Zaab (pronounced sahp) Street Food is a local Lao-Thai restaurant in a suburb I regularly visit to meet friends for dinner. I had been to this restaurant once before and ordered the Pad Thai noodles and didn’t really love my meal, but my friend Jane really loves the food so I said I would give it another try…and can say I am very happy I did. Inside is a spin on a classic southeast Asian street food restauarant – beer ads hanging out the front, corrugated iron panels and graffiti on the walls, and low tables and stools to enjoy a casual evening meal. The menu is small and includes nice range of vegetarian options and lots of other dishes to share. Since retiring last November, I make an effort to catch up with the good friends I used to work with and as I hadn’t seen Kylie or Xenia since I retired I felt it was time for a catchup. Jane booked and we met up for a pre-dinner drink and chat and together walked to the restaurant. There is an extensive beer menu but none of us ordered beers; Xenia started off with a cocktail which arrived in a funky plastic bag with straw, Kylie’s came in a normal cocktail glass and Jane and I ordered wine. Most of the smaller dishes are for sharing so we ordered a few including the chicken satay sticks and crispy tofu with fried noodles. The tofu was so (so) good. Jane ordered two serves of the betal leaf which contained a spicy pork filling [she has had this several times before and loved it] – you roll them up and eat in one bite…loved by the girls. Also ordered was the Crying Tiger dish which is a Thai dish comprising strips of beef and a hot sauce. A lot of my friends enjoy this dish and whilst the girls said it was spicy, they did say it was very tasty. We also ordered two serves of the corn fritters and I ordered a roasted eggplant dish (no surprises here) to share with the other girls. Wow… this was very good as it was cooked to perfection with a particularly spicy tomato sauce…the girls loved this dish too. The final dish ordered by the girls was a grilled seafood platter to share. It came with king prawns, barramundi fillet, mussels and calamari and a nam jin sauce which I now know is a hot, sour and tangy Thai dressing. Looked pretty good I must say! As we were leaving I saw a noodle cart with fairy lights that serves meals during the day. And on a Friday/Saturday night it transforms into a DJ station – probably too late in the evening for me but guess it would be great for the younger crowd!! Always great to catch up with friends; we have decided to make this a regular event and will try out other restaurants in Canberra. I recently found out that Canberra has Chinese gardens…they were built in 2014 by a team of Chinese artisans who came from China. I was looking for somewhere to go for Chinese New Year and read about these lovely gardens located near the Chinese Embassy and along the shores of Lake Burley Griffin. The gardens celebrate the sister city link between Canberra and Beijing and is designed in the imperial Chinese garden style of the Qing Dynasty (1644-1912). The garden’s main feature is a traditional Chinese welcome gate guarded by two stone lions. Once you have taken in the lovely views through the welcome gate you walk down the handcrafted steps which were made by the Chinese stonemasons and past Chinese stone sculptures depicting the four celestial symbols in Chinese mythology. After seeing these lovely statues you walk towards the lake to a large replica statue of the Bronze Galloping Horse Treading on a Flying Swallow known in Chinese as Ma Ta Fei Yan马踏飞燕 and is regarded as a national treasure in China. The original sculpture is from the Eastern Han Dynasty (25-220 AD) and was unearthed by local farmers in Wuwei Country, Gansu Province in 1969. I read about the horse some years ago and in late 2014 I returned to China to see both the bronze statue at the Gansu Provincial Museum and the Zhangye Danxia Landform Geological Park (Rainbow Mountains) – both were amazing. The original statue is relatively small. It measures about 34 cm high and is 41 cm long. It’s posture is said to be unique and carefully balanced according to dynamics. The horse is raising its head, neighing and galloping forward and with one foot treading on a flying swallow. That swallow accentuates the power and speed of the galloping horse. Back to the gardens…whilst they are relatively small, they are really lovely and worth a visit especially as there are BBQ facilities for a nice BBQ lunch or dinner. In fact I am going there this weekend for a picnic with my Chinese language teacher. Located near the gardens are the Japanese Gardens which are also worth a visit [more on those later]. .
My second day in Botswana started with a river cruise (more on that in another post) followed by a vehicle safari. I had already done the east side of the National Park (well some of it as it is huge) so now our guide was taking us to the west side. We first saw a little wild dog running along the plains. I know it has a proper name but I can’t recall what it is (my blogging friend Mavis will surely know) It was tiny and very lean. Our guide then received a message on his radio from another guide advising of a dead buffalo or wildebeest located a little off the track. He said it had been killed by lions the day before so we immediately drove to that area to see if we could see the lions. On the way we saw a beautiful giraffe strutting his stuff on the road and others eating leaves and generally just looking around. Then we arrived at the location of the dead animal – wow did that smell awful! We were all holding our breath firstly because of the smell but mainly as we were all so excited about seeing lions in the wild. It was a very lucky day for us. We saw a lioness and two babies (well probably teenagers) who had just eaten and were about to take a nap. We all saw three but our guide found another baby having a little sleep. My eyes then went back to mum who was yawning ready for her sleep…I guess eating a buffalo is hard work!! And looks like this little one has been fighting with the scars on its nose. We were so grateful to our guide for taking us a little off our tour to see these majestic animals but boy did that day old dead buffalo smell!! We then drove down towards the water where there were plenty more giraffes taking a drink…I love the way they bend their long legs to drink. What a sight!! And several just hanging about waiting to have their photograph taken…so kind of them. We also saw hundreds of elephants, zebra, impala and beautiful birds…it really was a magnificent day [but I will save those photos for another post] . The monkeys were plentiful and rather sweet. And as we were leaving for the day, a car with two tourists stopped us and asked about lions so our guide kindly showed them on their map where they were and in exchange they told us about a pack of wild dogs nearby…so off we went and found them under a huge bush. They were very difficult to see with their colouring acting like a camouflage but we did get a couple of photos – such lovely looking animals. Then back to our resort for another delicious dinner followed by a good night’s sleep. I had read about the Chinese restaurant at the Canberra Casino which had very good reviews but had not particulary wanted to go there as it was located inside the casino and guess I didn’t think it would have great ambience being next to gambling tables. But… recently I read another review at the beginning of Chinese New Year (gong xi fa cai to my Chinese friends) which again mentioned how good the food is…so knew I had to go especially over CNY. And as it was CNY, my friend Jon and I first visited the Chinese Gardens in Canberra [pot to follow] and then drove to the Casino. You have to first walk through the Casino floor, which is pretty small compared to those in Sydney (where I have been for work) and Las Vegas (also for work) with a bar next to the entrance to the restaurant. We were the only people in the restaurant which had lovely Chinese lanterns all throughout and was served by a beautiful girl who was born in Japan and moved to Australia to be with her partner; an Aussie boy – lovely chatting to her I must say. There was a lunch special on during the week; being the choice of pork, chicken, egg or tofu wheat noodles for $10. These were inexpensive so we decided to try them along with other dishes. The bowl came out filled to the rim firstly with the noodles then topped with all vegetables, tofu and ginger – such a filling dish. I am not sure where the name Natural Nine comes from but all the colourful paper place mats have the Chinese character for the numeral nine on them and also the same character is on the walls. They all look fabulous. The menu is extensive and great for vegetarians and I think that is why we ordered so much food. First up we ordered the steamed mushroom and water chestnut dumplings with black garlic dressing and as Jon loves spicy food and chicken wings he ordered the Sichuan pepper and lime chicken wings. Both dishes arrived pretty quickly which made me think they are part made and heated up when ordered but my dumplings were still very good and Jon said the wings were extremely tasty. Our next dishes were the sweet and sour plum eggplant with handmade egg tofu – best dish ever!!! I loved it. This came served with a bowl of steamed rice but as we had ordered another rice dish we did not touch it. We also shared a bowl of exotic mushroom and burnt onion wild fried rice; so delicious and such a big bowl, so we only were able to eat about half. Shame we were so full as it really was very good. This restaurant is well worth visiting; such good food. After lunch we head to the Casino and watched a few people start with a huge pile of chips and end up with none!! I guess that is why I never gamble!! They also serve a Chinese High Tea on a Friday and Saturday afternoon with both savoury Chinese treats and sweets – so must return! When I spoke to the waitress, I had mentioned that the paper place mats were fabulous, so when we went to pay she gave me two to take home…very kind! !